Becoming prom queen is a committed, exhaustive process. You need to be socially connected and must know how to be a friend to everyone. If you are good at fitting in, remembering names, and are comfortable around strangers, you may be the next monarch at your school's most important dance of the year. The best way to become prom queen is to act like you already are one. Be a balanced individual and know how to be friendly. Your goal is to be liked by the majority at any given lunch table, and to do that, you have to know how to make the rounds while feeling content and comfortable. Volunteer at the library or at an animal shelter. Be friendly to customers at an after-school job. Participate in a religious activity. You should also have specific goals set for yourself. Know what colleges you'd like to attend if you haven't already been accepted and discuss your career goals with other students while also showing interest in theirs. Be helpful to friends and strangers. Be seen talking to members of different social circles. Hang out with others who demonstrate these qualities. A worthy prom queen always keeps school as her first priority. Students want to vote for a focused young woman with a sharp mind, and that means never falling behind class or missing school for social reasons. Your record will be the deciding factor for some who want to vote. Be sure to casually remind others about your past experiences in high school. Maybe you didn't have time to join their club this year, but you were an active member in the past. A literary type would appreciate knowing how much you enjoy your favorite poet. There are many ways to run a successful campaign so you have the best possible chance of winning. Even if you don't take action right away, plan ahead regarding what activities and events you'd like to get involved in. Begin asking friends and family members why they'd vote for you and how you can get others to do so as well. They may note some personality traits of yours that can be highlighted during your campaign. Enlist others to assist in making posters and banners. Having others give you a hand will take some pressure off of you and you never know if someone will come up with an amazing idea that can help you win. Be sure to thank everyone who helps you. Offering a small gift or treat at the end of your campaign will show those that helped you how much you appreciate their hard work. Maintain fun social media with the permission of your parents and invite others to visit your site and learn about you. Accept all friend requests from students at your school. Make class or assembly announcements. The more people hear about you and become familiar with your name, the more likely they are to vote for you. Exposure can be a powerful tool when it comes to campaigning successfully. Be sure to sound friendly and relatable during your announcements and try to come up with a catchy slogan or cute rhyme that people will remember when they see your name on the voting ballot. Decorate your car and locker with fun images and your slogan. You can also ask the owners of local hang outs if you can post campaign banners at their establishments. 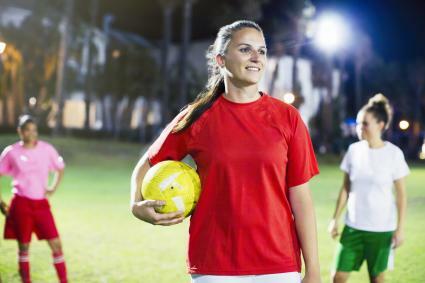 Joining clubs, sports, and groups can help you get to know more people at your school. The more people who hang out with you and get to know you, the better chance you have of attracting more votes. Be sure to let your personality shine. Interact with people who you normally wouldn't and be kind, polite, and show interest in what they're in to. If your school allows it, organize a few fun events during lunch that promote you. 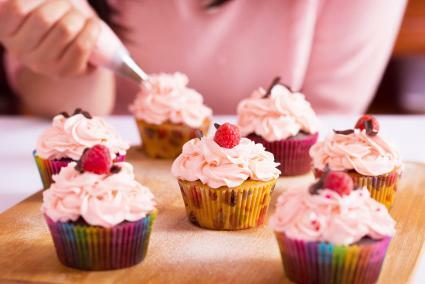 These can be mini talent shows, cook-offs, and impromptu dance parties. If your school approves, hand out fun cupcakes, shirts, buttons and bracelets with your name and slogan on them. Try to get your friends to wear these items to promote you as a candidate. 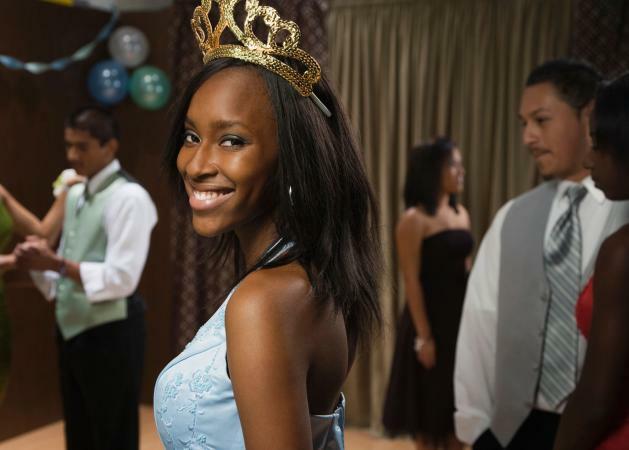 A friendly demeanor and winning attitude is the best way to become prom queen. Display your integrity and show that you are worthy of the title. Don't forget to show good sportsmanship and act respectfully towards other candidates. Each school's nomination process is different. Typically, students vote for their favorite individuals, and those with the most votes become a part of the prom court. From this elite group, a final vote is taken to elect the prom king and queen. Assist the prom court or committee in planning and setting up the prom. Offer fashion advice to other young women. Make guests feel welcome at the event. Engage in special participation at football games, spirit week, or other school activities. Along with the fun and glamour of holding the crown, there are also challenges. Balancing schoolwork, family life, social pressures, and extracurricular activities can be a lot to manage. You need to stay organized. Don't forget small obstacles, either: Does your dress need alterations? 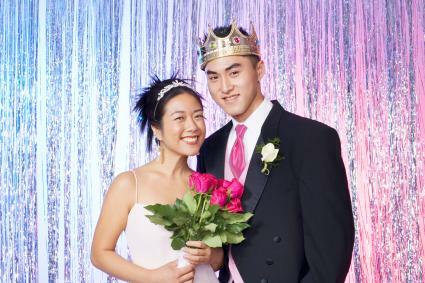 What if the elected prom king is not your boyfriend? Be ready to handle these issues in a calm, sophisticated manner.